Last week in Madrid Leo and I had our 6 minutes of fame - and we enjoyed every minute of it ;-) Why? We were on stage! 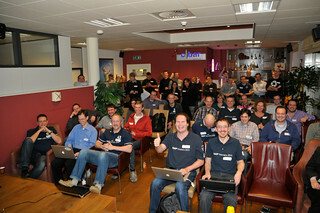 As SAP NetWeaver enthusiast one of the highest things to achieve is being on stage at #DemoJam - really! It was not only geek stuff on stage, we really had a customer business case to replace a cumbersome paper flow process. But of course we gamified this a little bit. Just in time - we had all components working together on the Friday before DemoJam Tuesday. We managed to get our show within 6 minutes. We got supported by Peter Peshev and his team to get the cloud working for our scenario. I was allowed to play with trucks and Lego on stage during SAP TechEd. The audience cheered for us during and after our show. Thank you for having us on stage and for all that cheering during and after the performance. Leo and I will work on blogs that explain what and how we have realized the #GarbageCollector. By the way - colleague Sven van Leuken created his own movie and included the intro from Ian and me cleaning up the Lego mess afterwards. How is the SAP TechEd Top 10 put together? With the excel download I filtered the Title column on specific keywords, like HANA. For each topic the number of sessions is counted and that delivers a Top 10. So what's hot and what not at SAP TechEd in 2012? There is no Java found in any of the session titles. Bit strange as al lot of cloud development is done with Java. Again only a very little attention to Microsoft, SharePoint or Duet. I counted 2 sessions. HANA moved up from 4th to second place. No surprise though. Cloud entered the Top 10 from nothing (last year OnDemand made it to 12) to 4!! Since last year SAP's message is about bringing Cloud, Mobility and InMemory to the core. You can see that resembled in numbers 2, 3 and 4. Happy that BPM and orchestration is still in the top 10. With all the news around Cloud, Mobile and HANA you could almost forget that it all relates to business processes! With the new Process Orchestration environment there will be a boost on this area. Gateway is promising, but only at 9. I expected this topic to be higher in the list. No session on UI5? I really don't understand this one. Probably integrated within Gateway or Mobile sessions, but still. Topic is interesting enough to have its own sessions. See you all next week in Madrid. Update - added links to previous Top 10's for your convenience.